The Atlantis opened on Paradise Island in 1994 and has grown to become one of the premier resort properties in the word. It includes 5 different hotel towers with different accommodation levels, a full waterpark, a spa, many fine dining options, and the largest Casino in the Caribbean. Spend your day at Aquaventure, the only water park of its kind in the world. 141 acres of aquatic adventure featuring numerous water play areas, 8 high speed body and inner tube slides, relaxing pools, beautiful white-sand beaches and a mile-long action river ride with white water rapids, rolling waves, ominous caves and never-before-seen special effects. 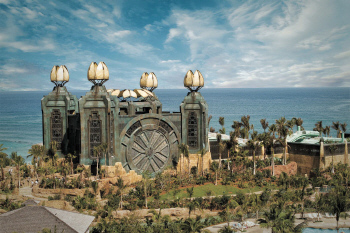 "Aquaventure", Atlantis Paradise Island's water park, is one-of-a-kind 141-acre waterscape. This water park is rated as one of the worlds top ten. This non-stop aquatic thrill ride features over twenty million gallons of water, incredible Atlantean-themed towers, thrilling high-speed water slides, a mile-long river ride with rolling rapids and wave surges, 20 swimming areas, a spectacular kids water-play fort and 11 unique and refreshing swimming pools connected by a lush, tropical environment that is both immersive and interconnected. For vacationers young and older, the water park offers an extreme level of excitement and delivers an "aqua" adventure unlike any other. Also included in your Aquaventure admission are access the Atlantis Beach and over 50,000 marine life in the marine habitats including the Dig (which is an elaborate replica of an actual archeological site). Explore a labyrinth of underground passageways brimming with large viewing windows filled exotic marine life. Guests must be at least 48 inches tall to ride all water slides. Children less than 48 inches tall may participate at Splasher's, Atlantis' children's water playground, and on the Aquaventure river systems. Children must be accompanied by an adult on a double tube, wear a life vest (provided free of charge and be large enough to support themselves in the inner tube opening.) Due to extreme limited availability of this excursion, guests are encouraged to book early. Ready for an experience like nowhere else? Book Aquaventure at Atlantis Paradise Island Bahamas now. To check in for Aquaventure, please make sure to bring your excursion voucher to the Discover Atlantis Tour Desk located in the lower level of Coral Towers at Atlantis, Paradise Island. Please Note: Lockers and non-motorized watersport equipment are available for rent at an additional cost and are based on availability. Atlantis Towels are provided to use for the day. The majority of the parks restaurants do not accept cash, so it is recommended that you bring a credit card. Gift cards can be purchased with cash for use in "cashless" areas. Availability of the facilities is entirely at the discretion of the Atlantis Resort and its staff and is subject to change without notice. No refunds will be given for facilities, pools or slides not open during the course of the day. Please note some facilities may not be suitable for young children or individuals who do not meet the minimum height requirement or who may have mobility problems. The guest service attendants will be happy to explain where a more suitable pool area may be. Likewise the resort also reserves the right to deny adults access to some of the pool areas or slides specifically designated as children's pools. The Atlantis Aquaventure Day Pass offered through Majestic Tours begins at 9.30am from the Discover Atlantis Tour Desk located in the lower level of Coral Towers at Atlantis, Paradise Island. Guests staying at the resorts on Paradise Island, who are not guests of the Atlantis may make their way to the designated check-in area on their own. We recommend for those guests staying in any of the resorts in the Down Town area or on Cable Beach, that they choose the tour option with transfers included. For those guests a roundtrip hotel transfer is provided by Majestic Tours with a pick-up from their respective hotel at 8.30am and a return pick-up from the Atlantis Coral Tower entrance at 4.30pm. For assistance in finding the check-in desk at the Atlantis Resort, please request an Atlantis Resort map from either your Majestic Tours Representative or respective booking agent. 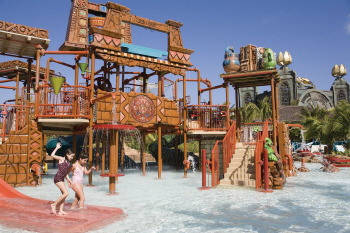 For maximum enjoyment of the facilities and restaurants at the Atlantis, and in order to reserve your locker, please bring your credit card with you, as the facilities surrounding the Aquaventure Park are cashless! Lunch voucher is included (Seasonal). Water Safety Rules and Regulations: Guests must be at least 48 inches tall to ride the water slides. For your own personal safety, please follow the complete set of rules posted at all pools, water slides, lagoon and beaches. Exercise caution when walking around pool decks as wet surfaces may be slippery. Please do not run. Beach, sand, and deck surfaces may be hot. Wearing shoes, sandals, or "aqua socks" is strongly recommended, especially for children. Guests with visible injuries (i.e. casts, bandages, etc.) are not permitted to ride the slides. Please remove all jewelry, watches and eyewear before riding the slides. Do not place valuables in swimsuit pockets. Wrist pouches may be purchased at the Towel Huts to secure personal items. Swimwear with zippers, rivets, buttons or metal ornamentation is not allowed on slides. Pregnant women and persons with heart conditions or back trouble should not ride the slides. Most water features are monitored by lifeguards during operation times which are posted at each entrance point. The water features are closed after this time and swimming is not allowed. It is a government regulation that children under 16 years of age that are within pool and beach areas must be accompanied by an adult. Please do not swim beyond the designated areas marked by buoys in Paradise Lagoon and the ocean. Whilst exploring the Atlantis waterscape, please do not climb on the rocks or get too close to the sea creatures in the exhibit lagoons.